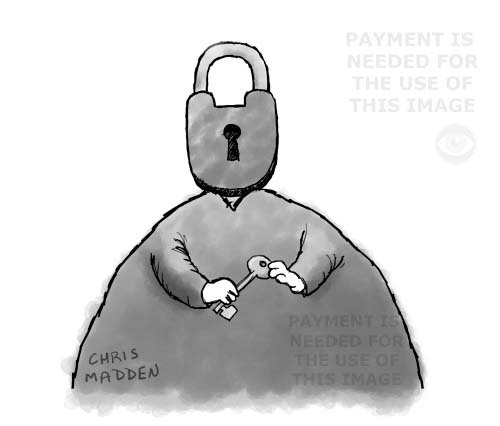 A surreal or bizarre image showing a person with a head in the form of a padlock. The person is holding the padlock’s key in their hands. The drawing was created with no idea what it means, although it’s probably an unconscious metaphor for something as it gives the impression of aspiring to be psychologically profound. Perhaps it’s meant to refer in some ways to psychology, the workings of the mind, the conceptualisation of ideas and so on. Maybe it’s about the way that people become locked into patterns of thought and behaviour (while holding the key to escaping).